The perfect gift for the finishing touch to a Christening Suit. This Boutonniere may become part of a wedding bouquet or attached to a wedding garter in years to come. 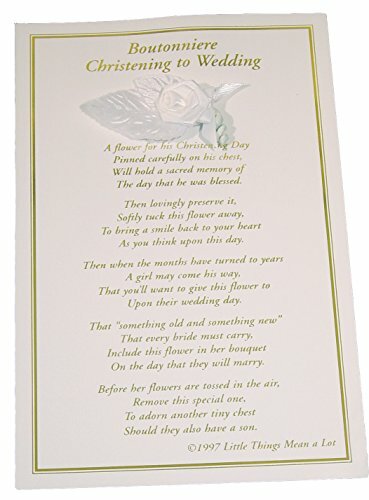 This item is packaged in a clear envelope with a sentimental poem explaining the concept printed in gold lettering on high gloss card stock. This Boutonniere may become part of a wedding bouquet or attached to a wedding garter in years to come.